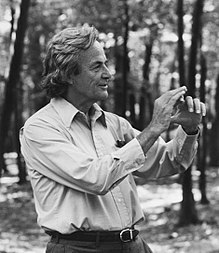 May 11th, 2018 marked what would have been the hundredth birthday of theoretical physicist Richard Feynman. Many physicists name Feynman, who passed away in February 1988, as their primary inspiration in the field and science enthusiasts all over the world frequently quote Feynman’s dry wit and blunt wisdom. According to a poll of scientists conducted by Physics World in 1999, Feynman was amongst the top ten highest regarded physicists, sharing acclaim with Einstein, Galileo and Newton. But what is it about the man that captivates so many? There are many valid responses, his undying curiosity, his naive wonder and desire to understand how things worked, his lack of deference to authority and rebellious spirit. Another common answer may surprise you as it involves a quality rarely associated with physics or science in general for that matter. Simplicity. Feynman’s genius lay in his ability to understand and present complex ideas in an intuitive and natural way. It is the reason Feynman remains an inspiration. He would exemplify this concept many times during his career, but never more so than in the development of his Feynman Diagrams. Simple line drawings that depicted complex sub-atomic interactions.